In 1976 Rosanne Alexander's boyfriend Mike was offered the job of Warden of uninhabited Skomer Island, giving them ten days to leave college, get married (a job condition) and move their belongings to their new home. This is Alexander's account of the next ten years, spent in a place that became part of their lives. At its heart is their work as wardens, caring for important colonies of shearwaters, puffins and kittiwakes, and all the other wildlife on the Skomer. 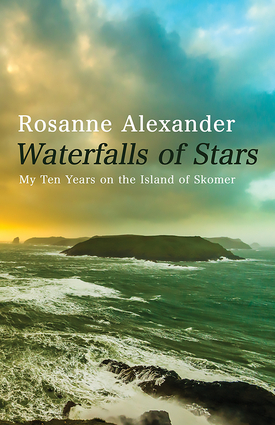 Waterfalls of Stars also covers their many trials on the island, from isolation and dwindling food during months of winter storms to witnessing the devastation of the island's grey seal colony by an oil spill. The combination of natural observation and resourceful tackling of the problems of island life makes this an attractive narrative for naturalists and would-be castaways alike and the pre-digital technology adds to the book's retro appeal. Alexander writes lyrically about all these things. Her depiction of the natural habitat, the weather, storms and, in particular, the island's seals is exceptional in its immediacy and physicality. The reader experiences all the delights and hardships of Skomer as though firsthand. Rosanne Alexander was a student of wildlife illustration in Carmarthen at the beginning of her Skomer adventure. She now lives in mid Wales, having continued as an environmentalist and illustrator. Her novel, Selkie, about the life of a young grey seal, was published by Andre Deutsch in 1992.